Editor: Copy/cut/paste options did not work for the selected text in RTF format. Fixes in the image conversion mechanism between HTML and RTF formats. Update of disclaimers/signatures in messages not containing TNEF part in the Sent Items folder. 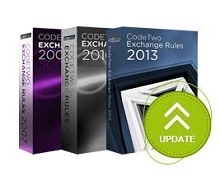 The update is free for all owners of licenses for CodeTwo Exchange Rules 2007 3.x, CodeTwo Exchange Rules 2010 2.x and CodeTwo Exchange Rules 2013 1.x. For more info on updating CodeTwo products make sure to visit this page. If you have any additional questions, give our Support team a call or send them an email – we are open 24 hours Monday through Friday (more working hours details here).